If you drive by a construction site in Greater Phoenix, chances are high it’s a hotel; we are currently experiencing a hotel construction boom in the Valley. The latest data shows construction and development of hotels is up 25 percent over two years ago. 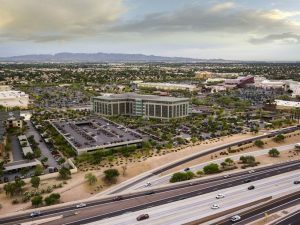 Eight new hotels are slated for Scottsdale alone—six of those near Old Town, with several more planned across the Valley. To give you an idea of what that means construction wise: there were more than 7-thousand rooms in construction across 50 different hotels as of third quarter in 2018, compared to 5,300 rooms under construction at 40 hotels in 2016. That’s an increase of 32-percent. According to STR, a company that tracks data for the hotel industry, what’s happening in Phoenix differs widely from what’s happening in the rest of the country. While hotel construction booms in the Phoenix metro area, numbers are actually down nationally—by 3.7 percent. So, what’s going on here? Well, it’s not rocket science. The Valley’s warm weather and natural beauty, not to mention a convenient absence of natural disasters, make tourism a top industry here. The proof is in the numbers. The figures released from Arizona’s Department of Tourism report that more than 43 million people visited Arizona in 2017 and they spent $ 22.7 billion. Phoenix’s unbridled downtown redevelopment is another factor. On that note, The Cambria Hotel is coming to Roosevelt Row in downtown Phoenix. It is a $26 million hotel project in downtown Phoenix’s Roosevelt Row Arts District may be a game changer. Located at 222 E. Portland, developers say the seven-story, 127-room hotel will be an upscale venue that features a rooftop pool, with cabanas and a bar. In midtown Phoenix, the new AC Hotel by Marriott just opened at 28th St. and Camelback Rd. Think of the AC as Marriott’s hipper, younger, heavily European-influenced brother. The 160-room, six-story hotel is meant to appeal to both business and leisure travelers. It serves a European-style breakfast and has a lounge that doubles as a co-working space by day and social hub by night. And then there is Old Town Scottsdale! As we mentioned earlier, six new hotels are slated for area. The iconic Don and Charlie’s restaurant closed, and a new 181 room hotel will go up in its place. Plans call for a smaller version of the iconic restaurant to operate in the new hotel, which will be six stories tall and cost about $50 million to build. Developers expect to be welcoming guests sometime in 2020. The Edition at Waterview located at Camelback Road and 73rd with 246 rooms planned. Southbridge Hotel located at Scottsdale and Camelback Roads. The hotel boom reflects a trend being seen in much of the Valley’s construction: building closer to the urban centers, rather than way out of town. Instead of trying to offer an oasis or escape from the city, these hotels, want to capture the vibes of the neighborhoods in which they will reside. Developers of the Don and Charlie’s property also hope to make it an entertainment anchor in Old Town that residents and tourists will frequent. Because of its location in downtown Phoenix’s lively arts district, True North, developer of the Cambria, wants to be a part of that scene. As such, it is partnering with a nonprofit to find artists to paint murals that will be featured inside the hotel. No matter what trend is driving the development of hotels in the Phoenix metro area, one thing unites all of them: more. The Valley will offer visitors thousands of new hotel rooms to choose from in the next two years. At Landmark Title Assurance Agency, we have worked on a number of hotel deals throughout Arizona and we have the expertise to handle even the most complicated commercial and residential real estate transactions. For more information, visit our website or call (602)748-2800.